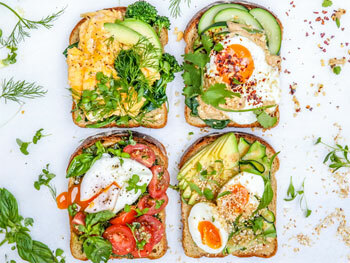 Nutritionist and Foodie, Jacqueline Alwill of The Brown Paper Bag has created four egg topper ideas for Australian Eggs, guaranteed to spice up your lacklustre morning toast. To make pesto: blitz all ingredients in food processor until uniform. Store in airtight container in fridge for up to 1 week. 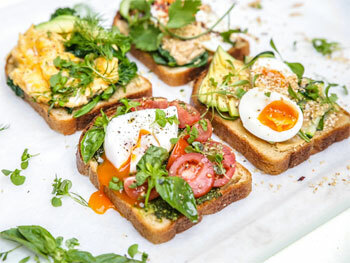 To serve: spread pesto over toast, top with poached eggs, cherry tomatoes and basil leaves. Season with sea salt and black pepper and serve. To make peanut satay: place all ingredients in a small saucepan on low heat, whisk together over heat for about 5 minutes or until smooth. Place in airtight container in fridge for up to 2 weeks. Heat slightly before using. To serve: place blanched zucchini slices and bok choy on toast with cucumber. Top with fried egg, drizzle with peanut satay to taste, sprinkle with chilli flakes and serve with fresh coriander if desired. For the greens: add olive oil to a medium frypan, then saute broccolini and baby spinach for 3-4 minutes or until tender and wilted. Season with sea salt and black pepper. To serve: place sauteed greens on toast, top with omelette or scrambled eggs, avocado and fresh herbs. Season with sea salt and black pepper and serve. To make the miso butter: melt the butter and whisk in miso until smooth. To serve: saute zucchini and baby spinach in a small frypan, spread toast with miso butter then place veggies on top, followed by boiled egg and avocado. Sprinkle with toasted sesame seeds, season with sea salt and black pepper and serve.